As we all know already, EX-BIR Kim Henares fools Filipinos on P1.56Billion Dunkin Donuts tax evasion case. Former BIR revenue office, Othello Dalanon accused Henares of "intentionally failing to collect & file charges" against Dunkin Donuts for P1.56B in unpaid taxes. Dalanon staed in his blog that Henares "fooled the Filipino people when she said his tax assessment against Dunkin Donut showed inaccuracies." Dalanon in his blog said that "This shows a huge discrepancy (substantial under-declaration amounting to P897 Million." "Clearly, it did not conduct a thorough investigation as it did not even require respondents to submit Dunkin Donut's tax case" Dalanon said. "Henares's statement has no basis in law and her claim is erroneous, because it is the law that determines finality of an assessment as clearly provided under Revenue Regulations No. 12-99 in relation to Section 228 of the 1997 NIRC, as amended." 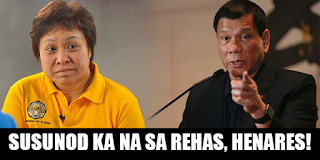 Henares fooled the Filipino people when she denied knowledge of Dunkin Donut's irregularities. On late 2015, Henares is the same person that didn't gave up on tax case vs. Senator Manny Pacquiao.